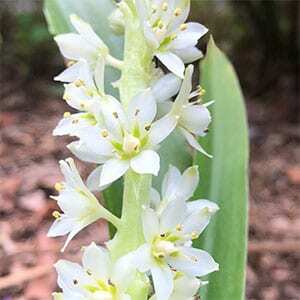 With attractive white flowers, Eucomis zambesiaca is one of the rarer of the genus. The flowers are typical, it is the clean white nature that makes them so attractive. Flowering in summer, the flower spikes rise well above the foliage to around 30 cms. Long lasting and as they contrast well against the mid green foliage they make a good feature in the garden border or when grown in a container. Grow these attractive bulbs in containers and put them on display as the the foliage begins to appear. Pot them as individual specimens for a nice architectural look, or let them clump up for a mass display. Plant them in the garden, near the front of the border in a sunny position and let them form a clump. Although the flowers are said to be fragrant, we find the scent to be faint at best. These are a bulb that require good drainage. The bulb itself is planted with the neck just at soil level. In the garden you can hill the area up a little if drainage is not good. They are winter dormant, and wet soils in winter months can cause bulb rot. In containers use a free draining potting mix and pot that has adequate drainage holes. Over the active grower period, from early summer to late summer, water well. As the foliage begins to die back, hold back on watering, and no water is really required over winter. In containers and in the ground, Eucomis zambesiaca will naturally form a clump over time. Every 3 – 4 years, lift the clump and divide them. The best time to do this is in early spring. Fertilise in spring using an organic slow release fertiliser, or a liquid seaweed/fish fertiliser. In wet cold climates, you may need to lift the bulbs over winter and store them in a cool dry conditions.